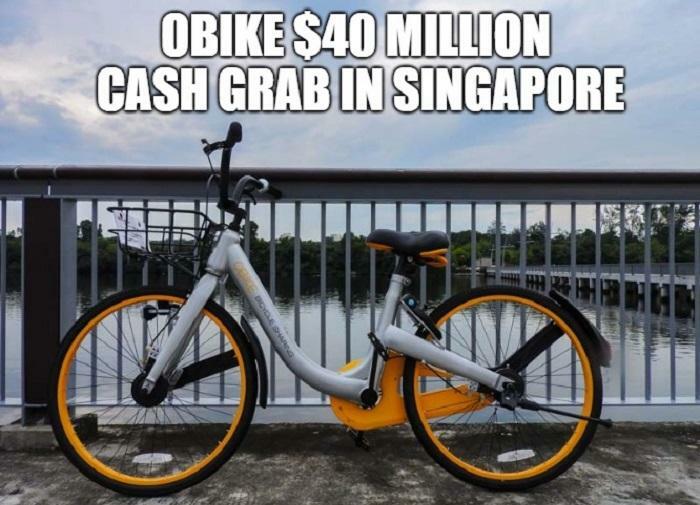 Obike Runs Away With At Least SGD $40 Million Deposits From Singapore Riders; No Free Lunch In The World – Sinking It In! Obike’s abrupt decision to cease its Singapore operations citing difficulties in abiding by LTA’s compliance framework shocked its 1 million service users in Singapore. Obike appeared to lay blame on LTA’s ‘stringent’ framework for its pull-out and left its users out to dry, many of whom had been seeking refunds on their deposits but failed. Despite the outcry, Obike’s silence on the matter and the quiet closure of its Singapore head office, hints of premeditated dishonesty on its part. Perhaps it was all along a ploy to ‘scam’ its users of their $49.90 deposits. According to news reports, Obike has up to 14,000 bicycles in Singapore. If each bike cost a premium of $500 each, the total sunk cost for Obike operations in Singapore is only $7 million. In contrast, if Obike received $49.90 deposits from all its 1 million strong subscriber base, it has almost $50 million in the bank. With its unceremonious exit from Singapore, would it be fair to say Obike earned a cool $40 million from Singaporean users. As Obike’s founders are based in Shanghai, China; How plausible is it for Singaporean users to get their money back? Would anyone jump through the legal and administrative hoops just to get back $49.90? Unlikely. May this be a good lesson for Singaporean users, there is no free lunch in this world, how many more Obikes do we need to have before people learn to protect themselves from dishonest startups riding on the ‘sharing economy’? Should Maids Be Hired As Live-in Nurses?